As an avid hiker, world traveler and having lived and worked in Singapore, Indonesia, Australia and America, it is the native art of these countries that has greatly influenced my artwork. My passion is weaving Western Red Cedar bark into life enhancing and meaningful artwork for us to treasure. 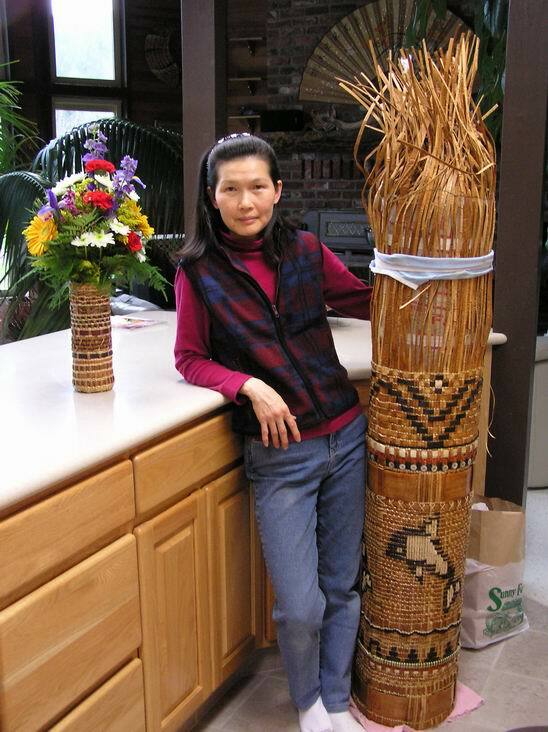 It was initially my deep appreciation for art of the Native Americans that became a springboard for me to weaving cedar bark, which is a traditional weaving material indigenous to the Pacific Northwest, now the location of my studio, Dancing Cedar Arts. It is during the summer months when the sap is most abundantly flowing within the cedar trees that the process of collecting bark begins, which allows me to enjoy the majestic forestlands of our region. Many of the materials used in my work are grown or found naturally on our own property. I also take pride in cultivating various rare species of plants that are incorporated into my artwork. The activity of gathering and processing the bark is very labor intensive and slow but is an important part of the process of creation. If you wish to learn more about the process or see what raw materials I currently have available, please go to the Materials page for more details. Most of the inspiration for my artwork is from the natural beauty of the Olympic Peninsula’s flora and fauna, forests, mountains, rivers and sea coast. Nature is a rich and endless source of ideas, colors, textures, forms and rhythm all of which participate in the graceful dancing of cedar art. The incorporation of antlers, driftwood, conks, seashells and many other materials often influence the form a sculpture ultimately becomes. Each piece of artwork is unique and none is a like. I love to experiment using new materials with cedar bark being the base. Creating a new life in cedar bark is a slow dance of contemplation, excitement and joy. Commissioned work is always welcome. If you see artwork in my studio or web-gallery that you like, whether that piece is available for purchase or has been sold, I will be happy to create a similar piece custom tailored to your choice of size, colors, materials and design. © 2008-2018 Dancing Cedar Arts | All rights reserved.